Toucans might be winning the race at being the most popular and trendiest bird of the moment, so we thought we would take the opportunity to help keep these colourful guys in the limelight with this week's flashback! Today, we are combining our love for toucans and home décor by creating this adorable hanging project! 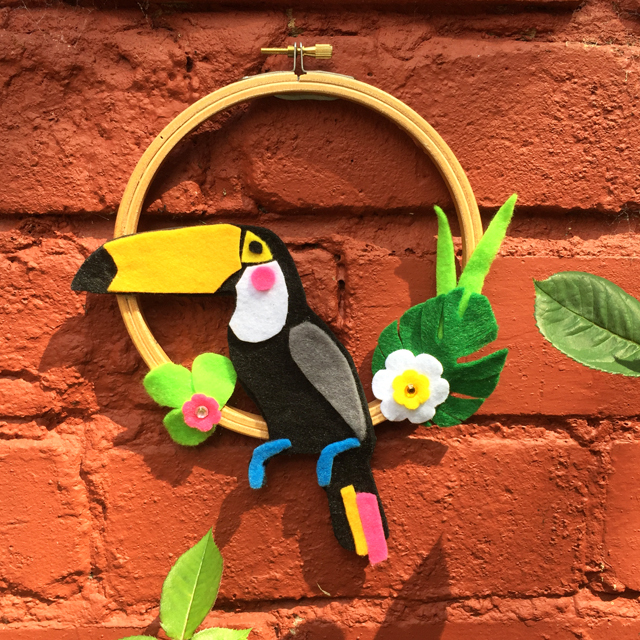 With our free template, an embroidery hoop and a few pieces of Dovecraft felt, you will be able to introduce a tropical look in to your home in no time! Read Cat’s tutorial to learn how to make your own! 1. 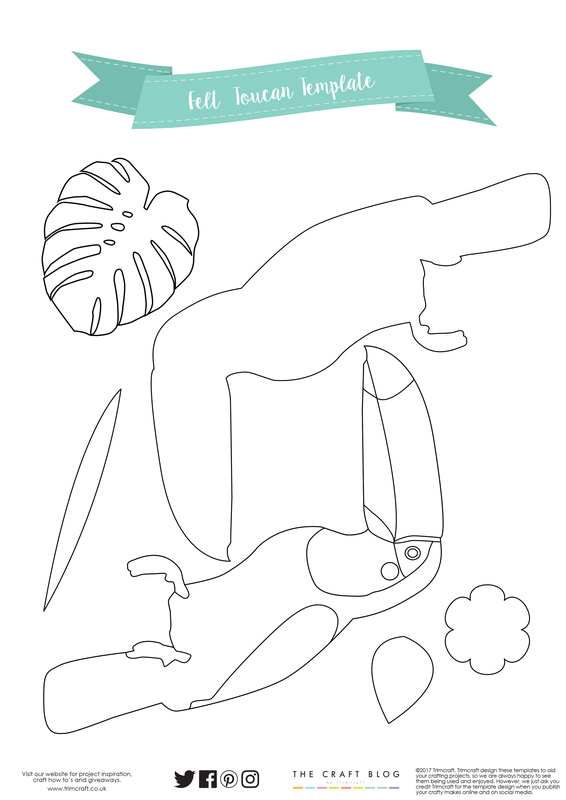 Begin by printing and cutting out all the elements from your free toucan template. 2. Cut out the silhouette toucan and then cut this around a piece of Dovecraft A4 black felt and a piece of Dovecraft A4 black card. 3. Follow the printable and cut out the colourful toucan onto the suggested coloured felt sheets (yellow, pink, white and blue). 4. Follow the template to glue your pieces on to your black toucan shape. TIP Print two templates, one to cut and one to follow. Adhere the felt toucan to the toucan shaped card you cut out. This will make the toucan more sturdy. 5. Cut out the leaves on to different shades of green felt and cut the flowers onto white, yellow and pink felt to add interest. 6. Before adhering, experiment where you would like your toucan and foliage to be on the embroidery hoop. Once you’re happy with the placement, glue the toucan to the hoop. We suggest that the toucan overlaps two parts of the hoop so it’s more secure. 7. Glue your foliage around the toucan, ensuring to space it out across the hoop. 8. Stick Simply Creative gems to the centre of your flowers. How will you use our free toucan template? We would love to see so don’t forget to #trimcraft when uploading to social media and to share your makes in the Inspiration area!